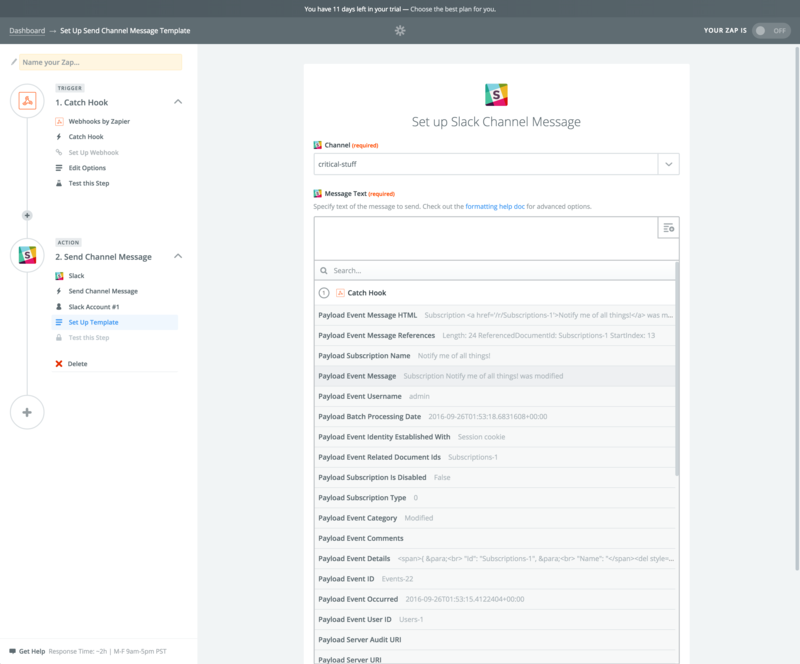 To introduce the new Octopus Subscriptions feature, we thought it'd be useful to show a simple example of notifying a Slack channel whenever something critical happens within Octopus. We'll work backwards through these steps to show how to build a basic subscription notification. We love Slack here at Octopus and it's the perfect candidate to notify us when important things happen (since we hardly ever check our emails anymore :) ). 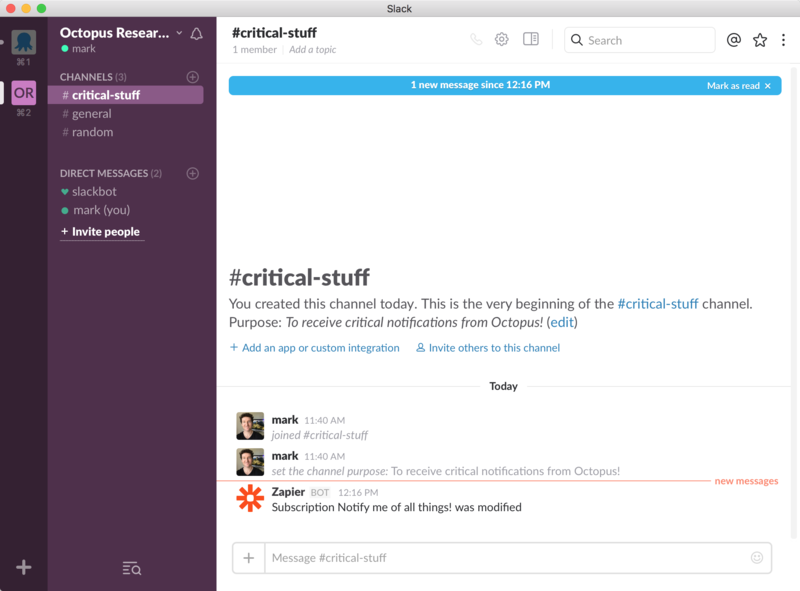 For this example, we've setup a channel called "critical-stuff" where we want to receive our critical notifications. We're going to use Zapier to host a webhook for us. Zapier will include a trigger (the webhook) and then run an action (notifying Slack). The idea being, Octopus will call this webhook whenever critical events have happened and Slack will be notified. NOTE: We're using a trial account of Zapier to illustrate our example here. 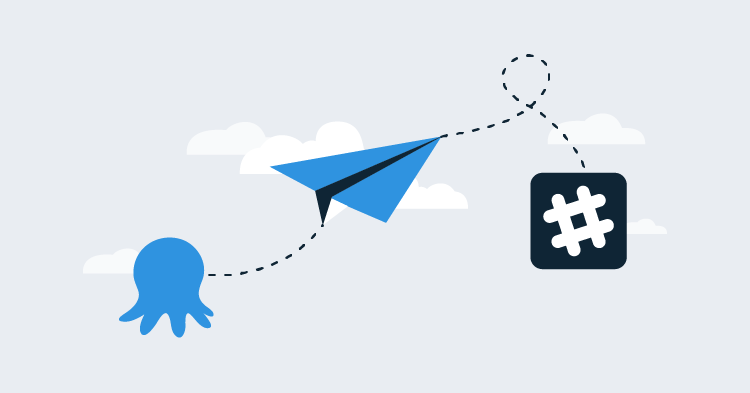 You may choose to write your own webhook and integrate the Slack API yourself, but Zapier makes this super easy to get up and running quickly and saves us time. Login to Zapier and create a new Zap. Select "Webhooks" from the list of built-in apps and proceed to create a "Catch Hook" that waits for a new POST. To test the connectivity and payload of this webhook, you will now need to jump into Octopus and setup your first subscription. But make sure you keep your Zapier screen open so we can confirm the test works and continue to add our Slack action later. You can download the latest copy of Octopus from our downloads page. As always, make sure you have a backup before upgrading. Once your have Octopus 3.5 installed, you can access subscriptions from the Configuration > Audit > Subscriptions menu. 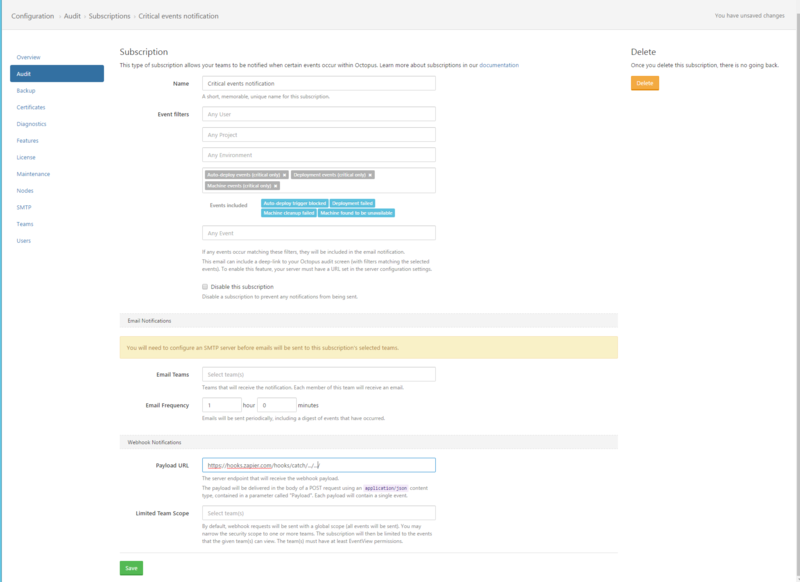 We can now proceed to create a subscription that calls the Zapier webhooks as soon as events become available. Once we save this record, Octopus will log an event that a subscription has been created. 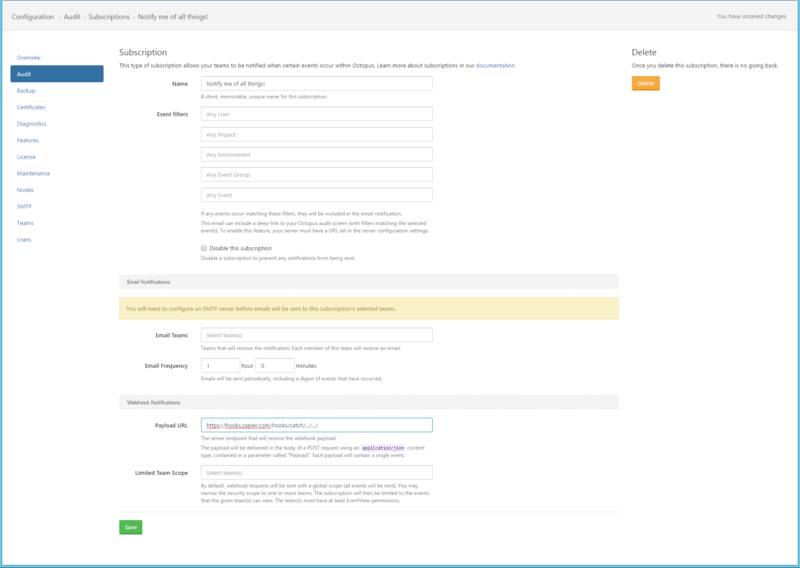 The subscription scheduler within Octopus will then process this event and trigger the Zapier webhook. Now that Octopus has successfully talked to Zapier via our webhook, we can integrate the Slack action. Add an action from the side menu in Zapier. Select "Slack" from the list of popular apps (or use the search function to find Slack). Select "Send Channel Message" from the list of actions. Connect your Slack account to Zapier (follow the prompts). 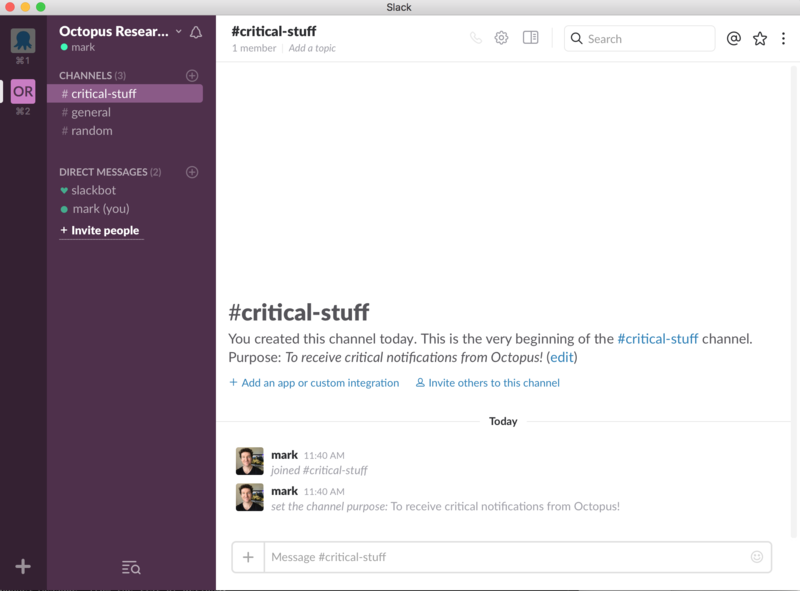 Once you arrive on the Edit Step screen, you may select the Slack channel you want to receive notifications on. In this example, we've selected the "critical-stuff" channel we created earlier. In our case, we want to know the "Payload Event Message". Remembering to save our Zap and give it a name (making sure it's enabled), we can now proceed back into Octopus and modify our subscription(s) to notify us according to certain criteria only. Open our subscriptions in Octopus. Select the "Notify me of all things!" subscription that we made earlier. Edit the name of the subscription to "Critical events notification". Select only the critical events by using an Event Group filter. You can learn more about subscriptions, including emailing and scoping subscription to certain teams) in our subscriptions documentation.